We’ve been hearing a lot recently about the city’s new micro-apartments. 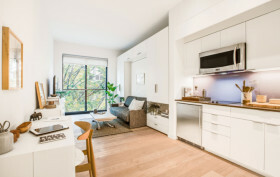 As 6sqft has reported, NYC’s first micro-apartment complex Carmel Place (formerly My Micro NY) at 335 East 27th Street began leasing at the end of last year. The nine-story modular development in Kips Bay has 55 studios that are 260 to 360 square feet. Of these, 22 are affordable and they’ll go from $950 to $1,500 a month. Market-rate units on the other end range from $2,540 to $2,910. According to CityRealty, the average rental price per square foot for New York City apartments overall is $51, while Carmel Place units ring in at $98 per square foot. The idea of micro-housing was presented, in part, to address the need for more affordable apartments. So why is it that the result is what a recent New Yorker article calls “micro-luxury” housing?